The level of success you experience and the volume of traffic you drive from local search is influenced by how well you rank when customers search with local intent. Basically, are your store locations showing up on page 1 when and where customers are searching? Rankings: How the search engines order where particular businesses appear on the search results page for a given local search term, or keyword. A better ranking (higher up the page) means higher visibility and more search traffic than businesses who rank further down the page or even beyond the first page onto subsequent pages of results. Where are the Local Search Rankings? The local search results can appear in a number of different formats (mapping apps, SERPS, local packs, knowledge panel, etc) depending on how and where the search query is entered, each determining the number of businesses seen by searchers. Let’s take a closer look at Google’s approach to each of these experiences. Google Maps: The most common of the three, map results are usually a combination between both a list of businesses and a map of where they are located. 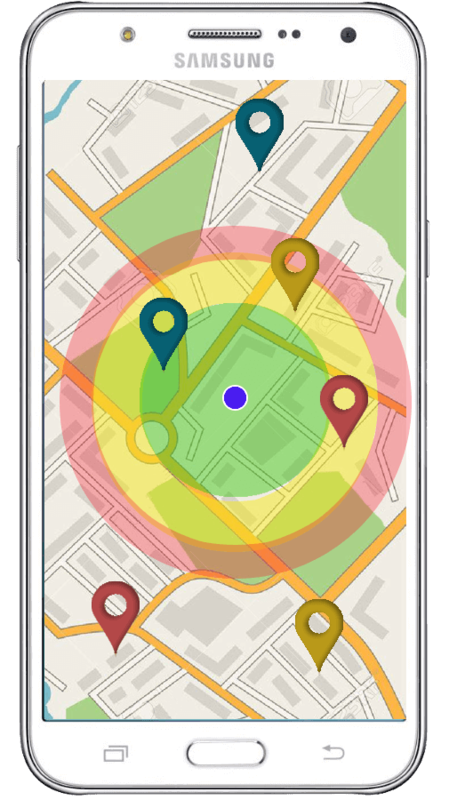 The maps results enable customers to quickly see all of the nearby businesses and where they are located in relation to their current location. Formatting and capabilities are very similar to both mobile and desktop searches on Google Maps. Google has yet to add any sort of advertisements into their Maps searching platform, both on mobile and desktop, but you should expect to start seeing them very soon as Google starts to monetize local search. SERP and Knowledge Panel: The knowledge panel appears in the SERP when it is overtly clear that a searcher is looking for one business in particular (ie. searching for the business by name). Google provides the searcher with sidebar result for that one business’s location page in what is called the Knowledge Panel. 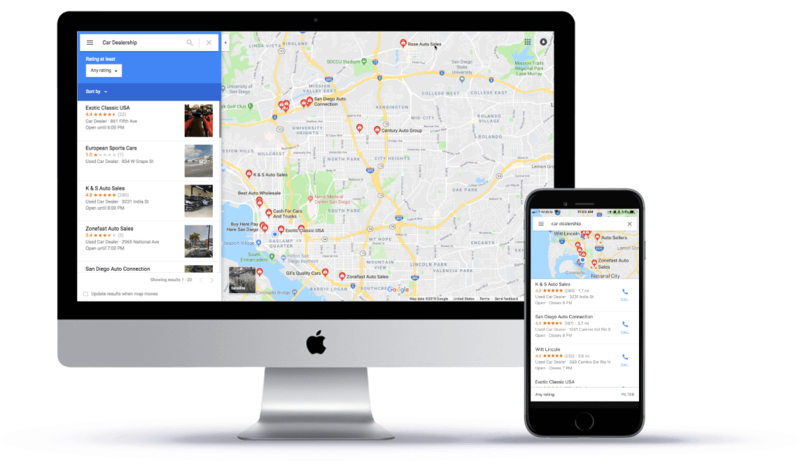 From here, searchers can see all of the relevant information about that single location like reviews, store hours, address, questions and answers, and photos. Search Engine Results Page (SERP) and the Local Pack: Also known as the local 3-pack, or the snack pack, this format of local search results occurs when customers perform an organic search with local intent. 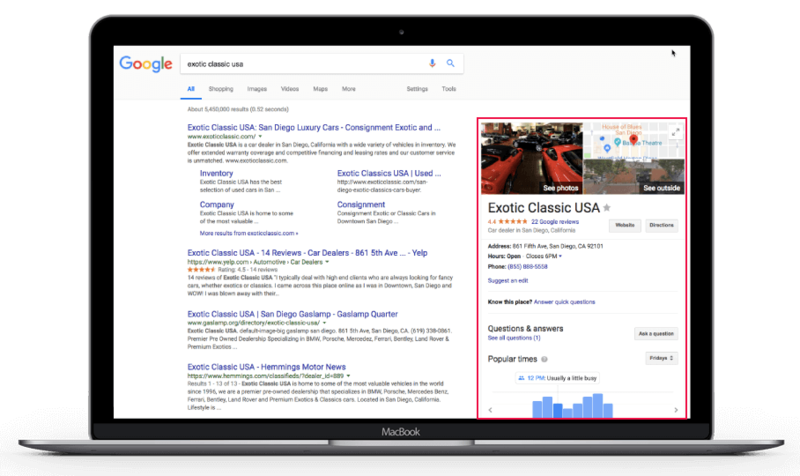 The search engine recognizes the local intent and delivers the top 3 ranking businesses in a pack along with a map preview towards the top of the SERP. Also, note how the local pack appears almost entirely below the fold, behind 4 advertisements. Mobile Voice Search: Mobile voice search has become increasingly more popular among customers looking to expedite and simplify their searches. 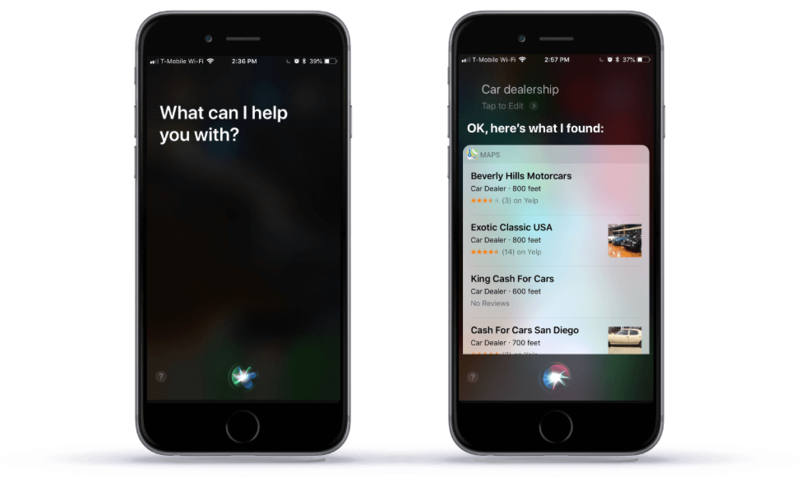 No more typing, they just let Siri and Google Assistant help make their decisions. A local voice search on mobile brings up results very similar to the list section of a local map search on mobile. Users can scroll through a list of options and select a business which will then open up that business’s information within the Maps app. With over half of U.S. teens and 41% of adults now using voice search on a daily basis, it is essential to employ Voice Engine Optimization (VEO) strategies. How are people really using local search (Branded vs Unbranded)? Many marketers, especially those working at big brands with large budgets for traditional media (tv, radio, newspaper), often believe that the majority of customers are finding their locations based on searching for their brand name (branded searches). However, that is false, even for the biggest brands in the world. By taking a look at the analytics reported by their Google My Business dashboard, they will see the wide majority of searches (from 60-90%) are unbranded. 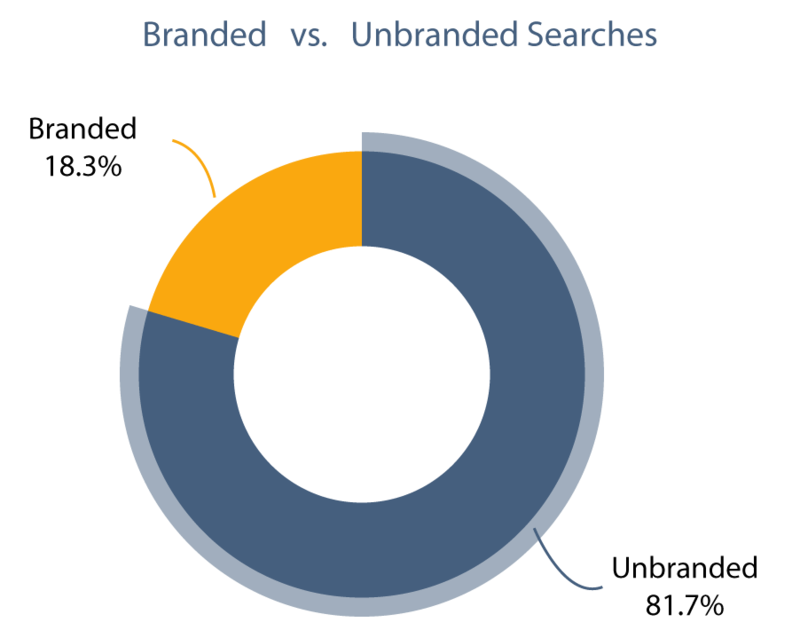 Unbranded searches are those in which the user is searching to fulfill a specific need, service, etc. (Seafood restaurant, Shoe store, Plumber, etc). Ranking well for unbranded searches and keywords is the cornerstone of success and driving local online traffic to your physical locations. If you are not on page 1 (ideally in the top 3) then you are losing a ton of customers to your competitors. Consumers don’t spend the time to flip through Google’s endless novel of search results to find you, which means your only option is to be among the first results that they see. Considering the unbranded keywords relevant to your business is important to think about because it helps you understand what the searchers who are most likely to become your customers are actually searching for. You can then use the most relevant unbranded keywords to tell search engines about your business, services, etc. so they can direct potential customers your way. There are multiple scenarios that could lead customers to your business. Understanding the context and intent of your customers’ searches will help you create a list of relevant unbranded keywords and different phrases that your customers are likely to use when searching. Truly understanding the intent and context that surround the needs of your customers becomes even more important as search engine enhancements and voice searching enable customers to get even more specific and complex with their searching. Where customers once searched for things like “Best Restaurant”, they are now searching for “What is the best Italian restaurant for a date downtown”. Knowing your customers and choosing the right local keywords leads to better rankings for more relevant searches and connecting with more qualified customers who are looking for your specific type of product/service. Once you have chosen your keywords, it is important to start working them into your content whenever possible. This means on local store pages, social media descriptions and even in your responses to customer reviews. The more you can naturally use your keywords the better Google will be able to understand your business and what searches it is relevant for. How do Google and other local search engines decide which businesses deserve the top spots? On average, there are only about 10 available positions on page one, and for mobile searches, this could be narrowed down to only 3. Understanding what factors influence your rankings and the weight search engines place on each factor is the first step towards optimizing your online presence and landing your locations on page 1. As of 2017, Proximity was the number one most influencing factor for the local search rankings, or how close your business is to the searcher’s location when they are making the search. Google knows that when making normal purchases, customers, on average won’t travel further than 15 minutes. Thus, they use the proximity of businesses to the searcher as a ranking factor to ensure that the results are more relevant and actionable for the consumer – somewhere they can get relatively easy. Proximity can vary based on your type of business. For example, Google may limit a dry cleaner request to a small area, but a search for a car dealer may result in much wider search area since people are more likely to drive further for that purchase based on previous user search experience. Categories are another mentioned factor under the GMB section; they are an essential element in the local search ranking process. Properly categorizing allows Google to better connect your business to connect to the customers searching for the services/product you offer. When choosing your primary category, you should choose something that accurately describes your business. Pictures and Videos are also necessary for the optimization of your Google My Business Page. Including images and videos to your listing shows legitimacy to the customers and search engines. When customers are scrolling through multiple Google listings, high-quality visual content can be a major differentiator as it improves their perception of your business. Listing Descriptions can be another way to take your GMB listings to the next level. The description is an informed characterization of your business that should use keywords and relevant phrases. Use this section to highlight exactly what your business does, what you offer and even the vibe that customers can expect. You will learn all about citations and listings in the next chapter, but for now: A citation is anywhere on the web that mentions your business name, address or phone number (NAP) and sometimes website URL. Your citations and listings are the foundation of your existence on the web. This is how search engines, web directories, review sites and most importantly, your customers know where you are. This is an important factor to consider as it is one that you have direct control over. With the right tools, you can find, manage, and edit important citations to keep them accurate and consistent across the web. The next area that search engines look at to determine how to rank businesses is the relevance of the business to the specific keyword being searched and to the searcher themselves. To determine relevancy, search engines will consider personalized data from the searcher, such as search history and the exact keywords used, and match that with data found on your listing, website and within individual reviews. Personalization factors such as these ensure that the search engine is delivering the most relevant and actionable results for each searcher. Accounting for 10.1% of the search engine ranking factors, Behavior and Mobile Signals is a category that is rapidly becoming more influential to the local search results and one that we expect to see continued growth in as mobile searching becomes more popular among consumers. Currently, over 77% of Americans own smartphones and nearly 60% of all their searches are initiated on mobile devices. In order to accommodate for the boom in mobile web browsing and searching, Google has even started their transition to a mobile-first ranking algorithm that indexes and ranks the mobile version of web page content rather than the desktop version. This places a greater emphasis on mobile-optimized content and mobile-friendly web pages. Review signals range from how many you receive to the actual content of each review to how many you respond to. They give search engines a better understanding of how popular and well-liked your business is in relation to your local competitors. 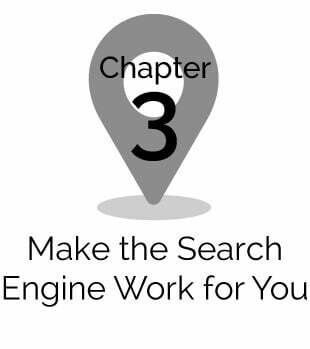 We have dedicated an entire chapter to elaborate on the importance of managing your reviews and how they influence your local search rankings. The level of engagement – comments, shares, likes etc. – a business receives on its social pages tells Google how popular that business is and whether or not customers are actively engaged with that business. In short, creating good social content and actively engaging with your customers helps to create a buzz around your business that correlates to a boost in other search ranking factors. Chapter 7 holds all of the information you need to know about social media for local businesses. What can a marketer do to improve their local search rankings? Local SEO is all about improving your rankings and becoming more visible to customers as they search the local web. Improving your rankings comes down to ensuring you have the foundational factors in place (the basic activities that are a “must have” in order for a business to even be eligible to rank), as well as implementing the competitive difference makers (those activities that will help you beat out your competitors). In order to rank, your business location must be near the searcher, generally within a couple miles radius. While you can still rank in searches that are made from outside that radius, Google will give preference to businesses most relevant to the searcher’s location. Google knows that customers value proximity and thus tries to deliver results that are most convenient for customers to get to. Since you can’t control where potential customers are making their searches from, it is essential that you optimize all of the other local search factors. Doing so helps you to cast a larger net and improves your chances at showing up in searches that are made from a further distance from your location. Categories are used by local search sites to determine what type of business/service you provide in order to connect you to the customers who are searching for your type of products and services. Choosing a proper category helps Google and other search engines deliver the most accurate and relevant results to their customers. Some local search sites will allow you to provide them with multiple categories (Google), while others may just be limited to one. When it comes to choosing your primary category, select one that is more precise than broad. 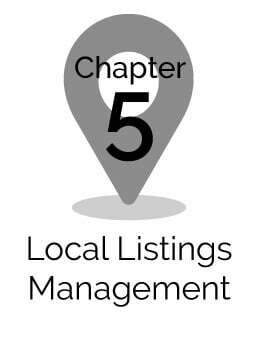 Citations or a businesses listings on local search sites and directories are a foundational factor that businesses must have in order to rank. They show search engines that the information they are providing to searchers is accurate and trustworthy. However, the quality of a business’ citations is much more important than the quantity. That is, it is more valuable to have consistent and accurate information on the top tier sites and data aggregators, whereas beyond that is more of a “nice to have”. You can find a list of the most important, top-tier sites in Chapter 5. While you can still rank in searches that are made from outside that radius, Google will give preference to businesses most relevant to the searcher’s location. Google knows that customers value proximity and thus tries to deliver results that are most convenient for customers to get to. Since you can’t control where potential customers are making their searches from, it is essential that you optimize all of the other local search factors. Doing so helps you to cast a larger net and improves your chances at showing up in searches that are made from a further distance from your location. Links: Short for hyperlink, links are simply a connection from one online resource to another related online resource or web page. Domains with a lot of links pointing back to it show search engines that this is a resource that is widely trusted around the web. The quality/authority of websites, industry-relevant websites, and locally relevant websites that are pointing back (linking) to your domain has a huge influence on how search engines see your website and business. 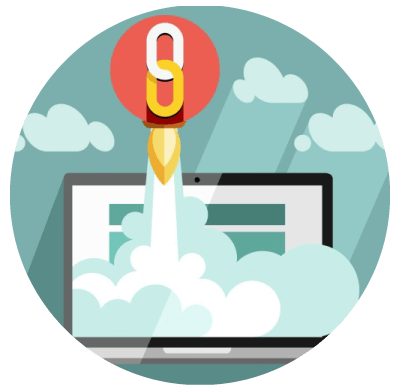 When other trustworthy sites are referencing or linking to your page, search engines then associate that level of trust with your business. Responding to reviews shows Google and other customers that you are active online and that you are listening to what other customers have had to say about you. A great way to build both positive and unique content is to stream reviews to your website. This can be done by adding a widget to your website that creates a live connection between your website and review sites like Yelp and Google. Then, as customers leave reviews on these sites, they are automatically streamed and displayed on your website. These are seen as a form of testimonial that can help promote your business to customers on your site and boost your rankings in the local search results.